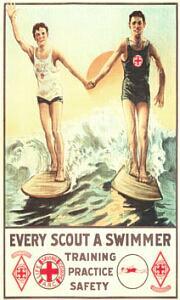 American Junior Red Cross . 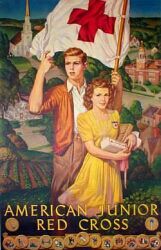 Eighteen million members in public, private, and parochial schools engaged in a program of activities planned to develop social consciousness and international understanding.
. Activities of the Junior Red Cross included classes in first aid, home nursing, accident prevention, swimming, lifesaving, nutrition, canteen, and staff assistance; junior first-aid detachments, disaster relief corps, bicycle corps, victory gardens; and a Nation-wide salvage program. Members made recreational and comfort articles for servicemen, produced garments for war victims, contributed to child war relief through the National Children's Fund, and filled gift boxes for children overseas. They also participated in international and countrywide programs of school correspondence. Local service projects designed to meet community needs were also part of the program. At the request of the Surgeons General of the Army and Navy, the American Red Cross collected volunteer blood donations to be processed into dried plasma and to be flown overseas for whole blood transfusions. Blood donor centers were operated in 31 cities by 1945, where blood was collected and shipped to laboratories for processing or flown overseas. Mobile units also visited nearby towns. Dried plasma made it possible for Army and Navy doctors to provide emergency transfusions on the scene of battle. The substances derived from the blood collected by the Red Cross saved the lives of many soldiers and sailors. .
. An agreement jointly signed by the American Red Cross and the Office of Defense Health and Welfare Services charged Red Cross chapters with the responsibility of providing "food, clothing, and temporary shelter" during the period of emergency following enemy action. Under an agreement between the American Red Cross and the Office of Civilian Defense, the personnel and services furnished by the Red Cross operated in conjunction with the Emergency Medical Service to meet needs arising from expected or actual injuries to civilians through enemy action.
. The Red Cross recruited and trained volunteer nurse's aides; trained people in first aid; provided dressings, bandages, and supplementary equipment, after consultation with the Chief of the Emergency Medical Service; equipped and operated emergency ambulances; and provided supplementary transportation for the walking injured and Emergency Medical Service personnel. As the disaster relief agency of the Nation and the community, the Red Cross was responsible for direction and coordination of disaster preparedness and relief measures. 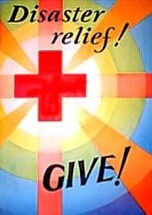 The Red Cross provided emergency relief and rehabilitation aid for families and individuals suffering from the effects of natural disasters, aided in rescue work, sheltered the homeless and supplemented available medical and hospital care. Rehabilitation was on the basis of need and included medical and nursing aid; rebuilding or repairing homes; replacing furniture and household goods, farm supplies, livestock, and equipment; and furnishing occupational training equipment and supplies. Red Cross responsibility in natural disasters remained the same in war as in peace. .
First Aid, Water Safety, and Accident Prevention .
. Red Cross first-aid training provided for the emergency care of injured persons in the absence of immediate medical attention. Water-safety training taught skills and procedures essential to security in and about the water, and for the rescue of those in danger of drowning. Functional swimming and water safety was a special course for the training of persons in the armed forces and for those approaching military age in the type of aquatic skill most useful in warfare. Accident prevention courses taught by the Red Cross emphasized the problems caused by common accidents that occurred in homes and on farms, as well as those which occurred in the day-by-day activities of boys and girls. Personnel were trained in the emergency care of the victims of highway accidents and highway first-aid stations were designated throughout the Nation; drivers of trucks, automobiles, and the like, were similarly trained, and their equipment designated as mobile first-aid units. Red Cross first-aid detachments were organized in mills, factories, department stores, apartment houses, schools, and other places where many persons were drawn together and where the hazard of exposure to mass accidents might be high. Close cooperation was maintained with governmental departments and agencies in the training of their personnel through the courses offered by the Red Cross. At the request of those in authority, the same service was provided extensively to the armed forces. .
. The program of the Red Cross Nutrition Service was an educational program designed to accomplish the following goals: (1) disseminate sound nutrition information and give helpful aids in applying it to varying food and socio-economic situations; (2) train Red Cross nutrition aides to assist in the Red Cross chapter nutrition program and in other community nutrition activities; (3) train Red Cross volunteer canteen workers to assist in emergency mass feeding necessitated by a natural disaster or enemy action, and in community projects such as school lunches and day care centers; (4) train in mass feeding groups such as food service staffs of schools and other lunchrooms or cafeterias, boarding houses, child-caring institutions, and homes for the aged; (5) train Red Cross volunteer dietitian's aides to assist in hospital dietary departments. The Red Cross nutrition program was coordinated with the Government's national nutrition program. . 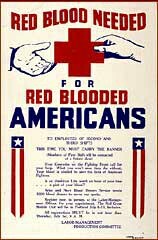 The Red Cross recruited and maintained not only a reserve of qualified nurses for the Army and the Navy for service in time of war, but also a reserve for routine Red Cross duties, including disaster relief. It also conducted a program in public health nursing and instruction in home nursing for laywomen. 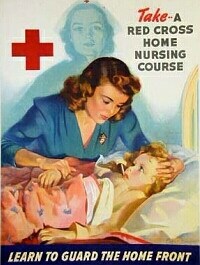 This course was based on the textbook, Red Cross Home Nursing, which taught the principles of personal, home, and community health, and the procedures necessary in caring for the sick at home. It had special value during World War II, when doctors and nurses were needed for military service, and the homemaker had to depend largely on her own resources. .